ground-based monitoring network can provide better temporal resolution on holistic changes in UV-I within the last few years. The sun gives off ultraviolet (UV) radiation that may be divided into three categories based on the wavelength: ultraviolet-A (UV-A, from 320 nm to 400 nm), ultraviolet-B (UV-B, from 290 nm to 320 nm), and ultraviolet-C (UV-C, from 100 nm to 290 nm). It is known that sunlight can impact the skin, causing premature skin aging, skin cancer, and a host of skin changes (Dharmarajan, 2008). Exposure to UV light, such as UV-A or UV-B, from sunlight accounts for 90% of the symptoms of premature skin aging (Dharmarajan, 2008). Ultraviolet light, UV-B in particular, also has the potential to harmfully impact vegetation and livestock. This is especially true at lower latitudes (30.8°S - 30.8°N) during the summer, where the amount of noontime UV radiation is the largest because of smaller solar zenith angles (SZAs). Due to the negative effects of ultraviolet light on humans, livestock, agricultural crops, and forest health, it is critical to be able to assess levels of UV radiation and to estimate its impacts. Many factors affect UV radiation levels and measurements, including extraterrestrial solar irradiance, atmospheric ozone, cloud reflectivity, aerosol amounts, and ground albedo. For example, changes in the earth's atmospheric condition caused by anthropogenic and natural pollutants has led to the well-documented decline in ozone and the corresponding increase in UV irradiance at the earth's surface. Yet the amount of ultraviolet radiation penetrating to the earth's surface with wavelengths shorter than 320 nm (UV-B) can be reduced by tropospheric ozone absorption, aerosols, clouds, and Rayleigh scattering in the atmosphere. radiation. In addition to the Nimbus7, the TOMS instrument was also flown onboard the Russian Meteor 3 from 1991 to 1994, on the Japanese ADEOS for less than a year in 1996 -1997, and is currently on the National Aeronautical and Space Administration's (NASA) Earth Probe. Ozone data may also be derived from the TIROS Operational Vertical Sounder (TOVS), the Stratospheric Aerosol and Gas Experiment (SAGE and SAGE II), the Global Ozone Monitoring Experiment (GOME) onboard the European ERS-2 satellite, among others. Together, these satellites provide a wealth of data regarding ozone and UV radiation (Wang et al., 2000; Fioletov et al., 2001; 2002; 2003; 2004). In addition, hundreds of ozone/UV ground-based stations are operating around the globe. Such a long-term, well-established ground-based monitoring network, equipped with the SUV-100 double monochromator instrument, produces consistent UV-B measurements which may be used as the ground-truthing data for satellite data assimilation. These data are well archived by the World Ozone and Ultraviolet Radiation Data Center (WOURDC) of the World Meteorological Organization (WMO) operated by Environment Canada. Stations in the U.S. include the National Science Foundation (NSF) Polar UV Network and the U.S. Department of Agriculture (USDA) UV-B Monitoring and Research Program (UVMRP), which was initiated in 1992 to provide information on the geographical distribution and temporal trends of UV-B radiation in the U.S. The initial network of 12 stations was established in 1994. The network has expanded to 37 climatologic locations plus several research sites. Comparisons of UV-B estimates between Nimbus 7/TOMS satellite data and ground-based measurements may contribute to the potential spatial application of satellite images in the future. retrieved UV irradiance. The Brewer data are lower than TOMS-estimated UV irradiance by 9% to 10%, on average. Cede (2004) obtained data over a period of more than 4,700 days from 1997 to 1999 at 8 stations of the Argentina UV Monitoring Network to study the major factors that are causing the differences between satellite-derived and ground-based UV erythemal irradiances and doses. Using hourly UV-I values at 45 sites in Canada, Fioletov (2003) made direct comparisons of Brewer measurements and TOMS data showing an agreement within 2% to 3%, except during periods of melting snow when variations in snow albedo yielded higher errors in the UV irradiance derived from both sources. Using long-term monthly mean UV-I values for Canada and the U.S. Fioletov et al. (2004) found that in summer, TOMS UV-I climatology values are 10% to 30% higher than those derived from global solar radiation and other parameters. In this instance, TOMS estimates agree with Brewer measurements. The difference is probably related to aerosol absorption and pollution effects in the lower troposphere which are not currently detected from space. For 21 of 28 mid-latitude Brewer sites, long-term mean summer UV measured values and UV derived from global solar radiation and other parameters agree to within +5% to +7% (Fioletov et al., 2004). The remaining 7 sites are located in "clean" environments where TOMS estimates agree with Brewer measurements, while UV derived from global solar radiation and other parameters is 10% to 13% lower (Fioletov et al., 2004). Advanced and comprehensive data assimilation methods are essential to model UV radiation from satellite data. These methods span from directly retrieving surface UV (Li et al., 2000), to statistical models (Fioletov et al., 2001), to the Lambert equivalent reflectivity (LER) method (Krotkov et al., 2001), to inversion algorithms (Wang et al., 2000; Ciren et al., 2003). The simple and efficient method for retrieving surface UV (i.e., DISORT-based model) relies on ground-based measurements as ground-truthing to improve the estimation accuracy. The statistical model developed to extend the record of UV back to the early 1960s estimates UV values (at individual wavelengths and spectrally integrated) from global solar radiation, total ozone, dew point temperature, and snow cover (Fioletov et al., 2001). 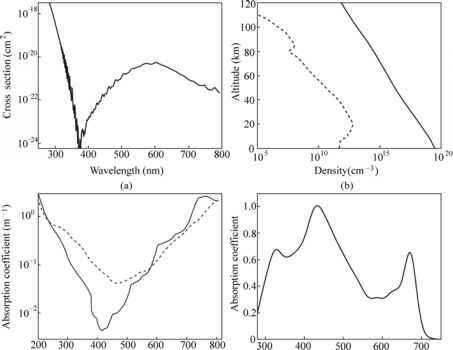 With such a similarity between the ground-based measurements and satellite data, a suite of trend analyses in regard to the UV variations at differing scales is feasible. By using datasets from the NASA TOMS from 1979 to 1992, Udelhofen (1999) confirmed that statistically significant increases in erythemal UV radiation exposures have occurred during the summer months in the tropics of the Australian continent over multiple decades. These were associated with a simultaneous depletion of ozone and a decrease in cloud cover. Chubarova (2000) analyzed the UV trend with UV irradiance data from Moscow over a 30-year study period. An algorithm was developed to calculate the variability in erythemally weighted (EW) irradiance for the entire period. The analysis of variability in UV 380 and EW irradiance showed a slight increase in UV values since the middle of the 1980s. Fioletov et al. (2001) explored variations of the UV-I in the context of climatology using both ground-based measurements and satellite data without including spatial analyses. Herman (2001) studied the phenomena of the quasi-biennial oscillation (QBO), and found that it can cause interannual changes of UV-B exposure by 61.5% at 300 nm and 65% at 310 nm at the equator and at middle latitudes. As seen from the literature review above, major efforts have been devoted to conduct time series and trend analyses of UV radiation. In this chapter, a thorough comparative analysis is conducted between the daily UV-B doses estimated from the Nimbus-7/TOMS data and those calculated from the ground-based spectroradiometer measurements. Ground measurements of daily UV-B data from 2000 to 2005 were collected around noontime (11:00 ~ 13:00) at the 37 ground monitoring stations in the USDA network. The corresponding TOMS data was investigated for the purpose of comparison. To show the statistical relationship between these datasets, an assessment of UV-I climatology was performed based on four representative ground stations.